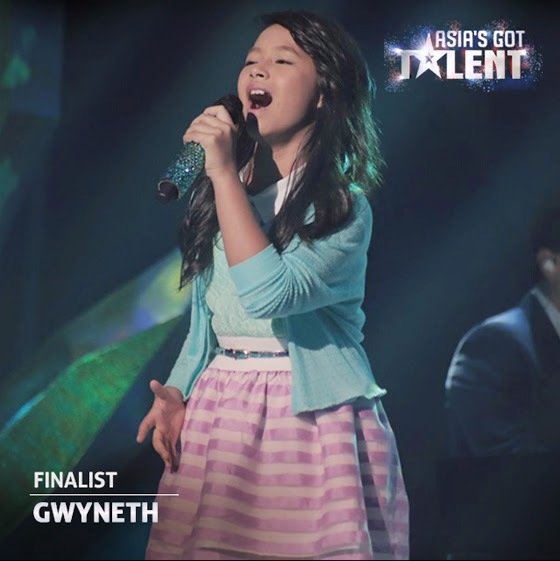 VIDEO: Gwyneth Dorado’s performance of "Titanium" in finals of Asia's Got Talent - Balita Boss! After a high production semi-final performance, Gwyneth Dorado goes back to the basics for an awe-inspiring cover of “Titanium.” The judges agree this is Gwyenth’s best performance yet! Ten-year old Filipina singer Gwyneth Dorado performed "Titanium" by David Guetta feat. Sia in Asia’s Got Talent Grand Finals on Thursday, May 7, 2015 held at Marina Bay Sands in Singapore. Aside from Gwyneth Dorado, there are eight other acts performed in the grand finals of “Asia’s Got Talent,” including fellow Filipinos Gerphil Flores - classical singer, El Gamma Penumbra - shadow play group, and Junior New System - dance group. Other acts were from Singapore (Dance Thrilogy), Thailand (Talento), Mongolia (Khusugtun), China (Gao Lin and Liu Xin), and Japan (Triqstar). The winner will be announced on TV channel AXN on Thursday (May 14). The prize includes $100,000 and an opportunity to perform at the Marina Bay Sands in Singapore.